The Morman family recently gathered for Anna’s wedding to Jordan Andrews. Pictured are, from left, Jackie Morman III, Caitlin, Jack, Anna, Jordan, Sara and Elissa. LaGrange College is a family affair for the Morman family of LaGrange. Jack Sr. came to work for the college in 1978 and has been a familiar face at the Charles Hudson Natatorium over the years, overseeing scores of swimming lessons and pool events. When his son, Jack Jr., was in high school, he had plans to attend the University of Georgia. That was until the head of the college’s theater department saw him perform in a high school play. He went on to earn another degree and became an adjunct professor at the college, served on leadership teams and worked as an announcer at Panther football and basketball games. He is now principal of Hollis Hand Elementary School in LaGrange. His wife, Sara, has often worked with prospective parents and shared with them the great experiences the family has had with LaGrange College. He got his wish when all three Morman daughters found their own places at LaGrange. Elissa, 25, earned her degree in 2015 and now works as an Admissions Counselor at the college. Anna Morman Andrews ’17 teaches algebra at Troup High School, and Caitlin is a sophomore Exercise Science major as well as a Presidential Ambassador, a member of Phi Mu and the new E for Empowerment women’s group. For as long as the Morman sisters can remember, LaGrange College has been a part of their lives. But when it came time to choose a college, both she and her sister, Caitlin, looked outside LaGrange. Anna also considered other schools until she realized she could get a quality education at a reasonable price on the Hill. The young women also became involved in Greek life on campus – although in different sororities. She served as vice president of community service for Kappa Delta and used the group’s local philanthropy as her service site for her time as a Servant Scholar. Elissa was a member of Alpha Omicron Pi, and Caitlin is with Phi Mu. The sisters have helped with Greek recruitment over the years and are passionate advocates for the college and the many opportunities it offers its students. 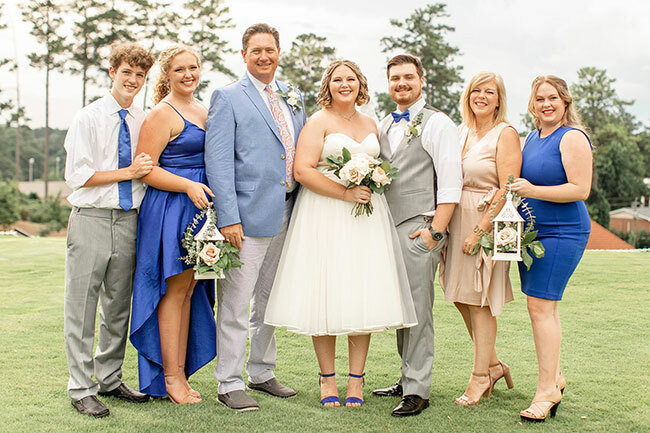 Jack and Sara Morman said they could not imagine a better place to send their daughters for the second phase of their lives than LaGrange College. After a week off, the Panthers (0-2) host The Apprentice School (Newport News, Virginia) on Saturday in Callaway Stadium. Kickoff is 1 p.m. Visiting Piedmont defeated the Panthers (3-2, 0-1 USA South) 4-1 in a USA South game Wednesday. Kaine Baker scored LC’s goal. The Panthers play at William Peace (North Carolina) on Saturday and at Warren Wilson (N.C.) on Sunday. The Panthers (2-2-1) play at Southern Virginia on Saturday and Sweet Briar (Virginia) on Sunday in non-conference games. LC had last weekend’s games with Greensboro and William Peace canceled due to Hurricane Florence. The Panthers (2-5) lost 3-0 to visiting Huntingdon on Tuesday in Richter Gym. Jazzlyn Kenner led LC with seven kills. LaGrange plays Covenant and Piedmont as part of a USA South tri-match Saturday in Lookout Mountain, Georgia. The LaGrange golf team opens its fall schedule at the Rhodes College Fall Collegiate Golf Classic at the Tunica National Golf Resort in Tunica, Mississippi. The tournament begins Sunday and finishes on Monday. The Panthers are ranked 25th in the Golf Coaches Association of America Division III poll. Saturday is Preview Day. Be sure to welcome visitors and offer a helping hand if needed. Don’t forget the overview presentation of this year’s “Magic of Morocco” 3D Journeys lecture and travel series at 10 a.m. Monday in Dickson Assembly Room. Hear from guest lecturers and learn about the trip to Morocco. For more information, call 706-880-8244 or email 3DJourneys@lagrange.edu. LaGrange Symphony Orchestra presents “The Beginning: A centenary celebration of American icon Leonard Bernstein” at 7:30 p.m. Tuesday in Callaway Auditorium. LC students with a current ID are admitted free, and tickets can be picked up at the door. @LaGrange - Você fala português?